At the age of 19, I did what we’re told to do if you want to lose weight – I started dieting. The restriction of dieting only served to ramp up the bingeing. With every diet, I would lose weight and put it back on, and a bit more besides. As my weight increased further, my self-esteem – which had never been particularly robust – was decimated. It’s my belief that you can’t achieve a sense of personal agency by following someone else’s instructions. The only way I could find my way through and make peace with food, my body and myself was to discover my personal autonomy. Instead of listening to other people about what I should eat, I started listening to myself about what I wanted. I learned to shut out the noise, stop judging what I was eating and handle challenging emotions I had been denying for years. Gradually, I developed a self-trust that influenced positively not only how I ate but every other area of my life. eatonomy is a word I came up with many years ago to describe that self-trust – the ability to decide for yourself if you’re hungry, what you feel like eating and when you’ve had enough. It’s about working with yourself – emotionally, psychologically and physically – rather than against. That doesn’t mean that life is suddenly magical and perfect – you still have stresses and worries the same as anyone. It just means you no longer turn to food to deal with them and have a better relationship with yourself. It’s my belief that you can’t achieve a sense of personal agency by following someone else’s instructions – it just doesn’t work. Therefore, this isn’t a hey-just-follow-these-10-miraculous-steps-and-your-problems-will-be-solved approach, it’s a stop-looking-outside-of-yourself-and-pay-attention-to-your-thoughts-and-feelings kind of thing. What I write here is intended to aid self-awareness and self-reflection, to help you discover that authentic inner voice that knows what’s best for you. In order to find that voice you need to be willing to have a conversation with yourself. That’s why my monthly blog post titles are questions – questions intended to prompt that conversation. I know how lonely and shameful it feels to be trapped in a restricting/bingeing cycle. I also know how liberating and empowering it is to make peace with food – it’s my hope that everyone struggling with the former can experience the latter. eatonomists assemble! Please see the new Community section in the menu. If you’re struggling with emotion-driven overeating it can be tough to find people who understand what you’re going through. It can be especially difficult to find someone to help you make sense of it. No wonder that so many people with overeating issues feel isolated and alone, exacerbating the sense of not belonging that they’ve often experienced from a very young age. 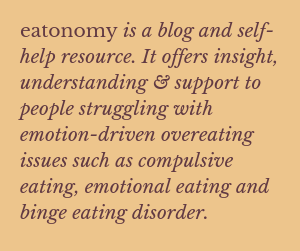 From January 2019, I’ll be facilitating a monthly eatonomy group in Norfolk (apologies to anyone outside of the UK and probably outside of East Anglia for that matter). The question posed in each monthly blog post will be the focus of discussion. This is a group for those of you who are serious about exploring and understanding your problems. It’s also a chance to hear other people’s experiences and build a supportive and motivated community. So eatonomists assemble! For more information about the group, please see the new “Community” section in the menu. “A moment’s insight is sometimes worth a life’s experience.” – Oliver Wendell-Holmes Sr.
Also starting in January 2019, you’ll notice three new monthly posts: “Expert Insights”, “Food for Thought” and “Gentle Reminders”. “Expert Insights” are short excerpts from the vast array of literature I’ve read over the past 20 years in my quest to understand and find my own solution to this issue. These are thought-provoking words from authors, researchers and practitioners about overeating and related issues such as body image, feelings, relationships and personal boundaries. “Food for Thought” feature enriching reflections from people who really have a way with words. These are offered to uplift and reassure you, and to encourage you to reflect and stay connected to the part of you that says “it’s OK, you can do this”. “Gentle Reminders” are monthly prompts about an aspect of the process of making peace with food and yourself, and often include a link to a previous post you might have missed. So welcome to eatonomy. That’s all my news – how are you? (My gratitude goes to the very talented, award-winning designer Maddy Russell at mrusselldesigns for the wonderful logo). ‹ PreviousHow Do You Measure Success? Next ›How Can You Make Sure You Have Fun at Christmas? Thank you, Lol! Your support means a great deal to me. I’m not great with the whole social media thing, but I’m learning – am finding Instagram quite creative. Glad you like “eatonomy” – it’s a word very dear to my heart. Many thanks for your comment. I can definitely relate. Food and binging would help me to sleep and escape. “Escape” is the word, isn’t it? That was definitely my experience too – a need to get away from feelings I thought I couldn’t handle. Thank you for sharing your experience. Thanks, Erin. I had a great time deciding which ones to include. I Love it! Eatonomy- what a great word. I’ll look forward to your new posts in January and will look for you on Instagram. An excellent post Julie, filled with inspirational quotes – l had tagged you for a 321 on Inner Beauty and then realised that you don’t do them. My bad – keep well. No worries, Rory! Thanks for thinking of me. Thank you so much for the reblog, Rory. I have nominated you for The Sunshine Blogging Award. Through your wonderful writing and your passion for helping others. You’re very kind, thank you. I’m afraid I don’t participate in blogging awards but I’m very touched not only by your nomination but by your thoughtful comment. Many congratulations on your award, very well deserved.